As we all know, history repeats itself, and fashion especially. Nothing is ever "new" on the runway (well, maybe if it's a suit made out of bubble wrap, etc. ), and this was true of past designers as well. Today in the Battle of Fashion we have headgear of the 1780s facing off against that of the c. 1910s (and a little earlier). I noticed the similarities in these two periods while finding inspiration for a Titanic Day hat of my own. The lampshade brims and the large "muffin top" crowns I was looking at for 1912 were so reminiscent of the monstro-bonnets of my favorite decade of dress, the 1780s. Doesn't it seem logical that one hat could do both jobs? 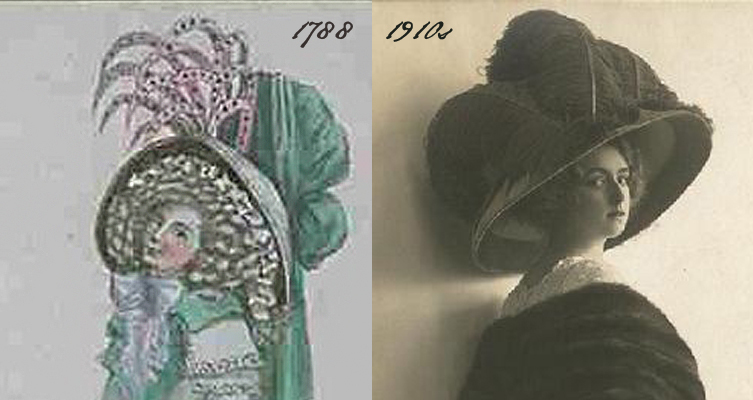 The black silk on the right, above, with the addition of some tall feathers, could surely time travel back to the 1780s, especially with that giant, snazzy buckle and bow. It's a well-known fact that the Edwardians took chapeau inspiration from the 18th century - the "Gainsborough," for instance - but I didn't realize the Merry Widow also derived from this period. So what do you think? Which period does it better? It's hard to trump the outlandishly awesome style of the 1780s, but the Edwardians were pretty sharply dressed, too. Which one has your vote? *Fashion plates were found at Dames a la Mode on Tumblr - great resource! I'm an Edwardian lover through and through! 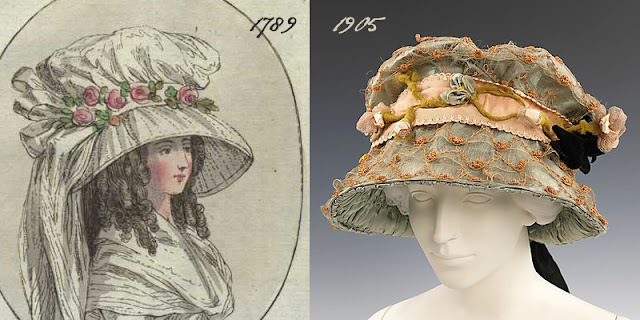 Maybe it is simply because I have only ever seen fashion prints of the 1780s hats, but those seem a tad on the ridiculous side. I especially like the picture of the woman wearing the black hat! That's a good point - I haven't found any surviving examples of these lampshade kind of bonnets from the 18th c. Maybe somebody knows of one in a collection somewhere? I bet they're weren't quite as silly as depicted in the fashion drawings. 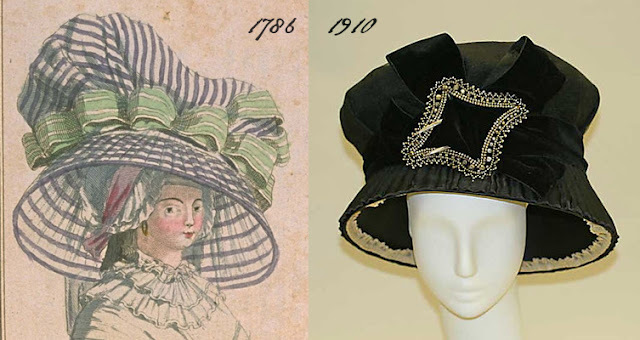 Those 1780s styles certainly give a new meaning to "Hattitude." Lovely! You wouldn't need an umbrella, would you? :) I like the early 1900s better as they don't seem to be as larger than life as the others. I've GOT to find my photos from an event in Puerto Rico 2 years ago. One of the ladies made a hat based on your first image listed... I'll dig and then send it to you via facebook. I wonder if the drawings are deliberately more huge. Perhaps it was a kind of exaggerationin much the same way as designers draw those sweeping willowy ladies today. The Edwardian hats are real and so will actually fit a head. Sam, absolutely. Fashion drawings then and now are always exaggerated. I bet they weren't nearly as outlandish. I like the 1780s best, but the 1910s would work too. I huge hat is a huge hat anyway you look at it. I like both. However, the 1910's versions are a little tidier and look to be a lot easier to wear without looking too silly. Yet, within the context of their contemporary times I like them both. Thanks for sharing. It is good to note that there was an 1th century revival that started in the early teens and lasted through the mid 1920's. If you look at domestic - household trends - you can see a lot of late 18th century influence. Cheers. 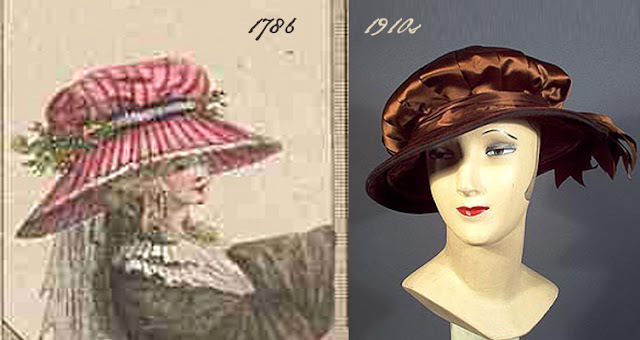 I love the 1910's versions, because although the hat fashion for both epoques is quite similar, I prefer the materials of the 1910's. Hi Ang - what kind of information are you looking for? The cap in the painting is a very large "dormeuse" style cap that would have been worn in the late 18th century. They were made of light cotton, linen, silk organza, and could be very decorative and large, sometimes worn over a huge hairstyle and under a hat, or to cover the hair completely. These were for day only - they were not considered formal and would not have been worn in the evening.